Hello everyone, Welcome back to Winnie & Walter’s birthday celebration challenges. How is crafting for the challenges going for you? Are you getting inspired and having fun? Yeah! I have another challenge for you. Creating the background for my cards is one of my favourite thing to do. I enjoy the process of using stamps and various technique to create a unique background for each of my card. The background also becomes the highlight of the card and it is a great way to stretch your stamp sets. So I have a card to share with you, where I have made a unique background using masking and sponging technique. To make this background, I have used images from Winnie & Walter’s In Bloom: Anna’s Flora stamp set. I stamped the flowers and leaves randomly on white card panel. Then masked all of them using masks made from stamping all the images on masking paper. Then sponged three different shades of distress inks – Salty Ocean, Mermaid Lagoon and Blueprint Sketch. This gives a beautiful ombre effect which adds interest to the background rather than one solid colour. It’s like magic when I removed the masks. Voila! The white stamped images pop right at you against the blue ombre background. How cool is that? I adhered this panel to a blue card base. I want to keep the background as the highlight of my card, So I kept my sentiment simple. I die cut three In a Word: Hello Cutaway using black cardstock. Stacked and glued them for dimension. Brushed the hello with Clear Wink of Stella shimmer pen and adhered on the bottom of the card front. Finally embellished with Pretty Pink Posh’s Sparkly Clear sequins. I thought I will make a video tutorial of this card. Enjoy! So my challenge for you is create your own unique and innovative background for your card. You can use any technique you want to make your background. Also make sure the background of your card is the highlight of your card. Have fun creating! I cannot wait to see what you come up with. Make sure you link your card to the linky below. Love the colors and design...sorry to miss the challenges because I am away. Ombre, and gorgeous! Wonderful card, Gayatri! Such a gorgeous background! Love it. Those white flowers literally pop of off your gorgeous blue BG. I love this background! Such bright happy colour. This is such a striking and dramatic card, love the white flowers with the bold blue ombre background!! So striking ..!! the background created is awesome !! This is such a beautiful card - love the colour of the background and how beautifully the flowers stand out against it. 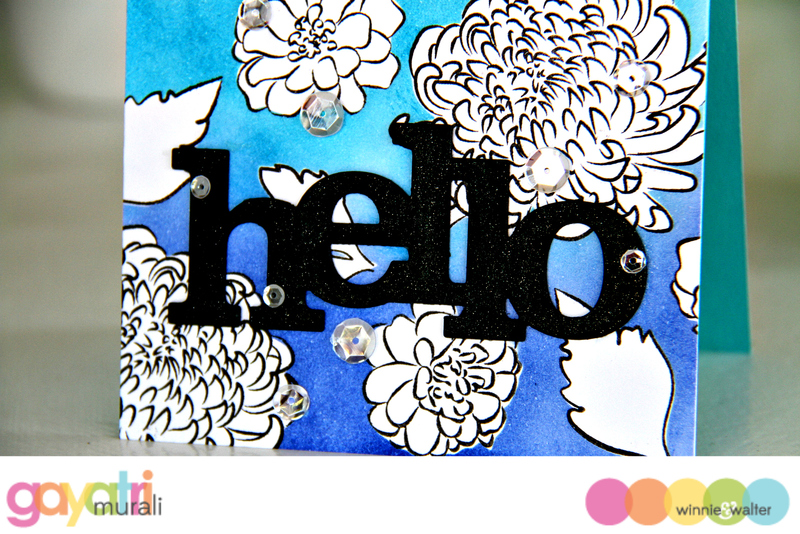 HELLO AWESOME - LOVE your BOLD & BEAUTIFUL card Gayatri, an EXCITING INKY design!!! GREAT techniques (& other cards) in your FABULOUS video too, THANK YOU for sharing!!! Love the bold look of your backgrounds. Beautiful card Gayatri!! Love the bold background! Beautiful card...Ombre effect is such perfect add! Your floral/ombre background is gorgeous! WOW! Such a wonderful card, Gayatri - thanks for the challenge! Love the bold design and pretty flowers! Fabulous work. Love the way the white flowers pop! Wow! What a great card! I love the blac and white images with those vibrant blues! Thanks for the video! Very pretty BG creation, love it Gayatri! This is such a fun idea. Can't wait to play. Love Gayatri's card and video! What a lovely reverse background! Love your backgrounds, Gayatri. The white flowers look fantastic with the ombre effect!